Financial companies were hit in 2008, but they are back full strength. As opposed to many sectors, financials usually benefit from rising interest rates. Canadian remains your best bet if you’re a dividend growth investor. Here’s the Financials dividend stocks list. 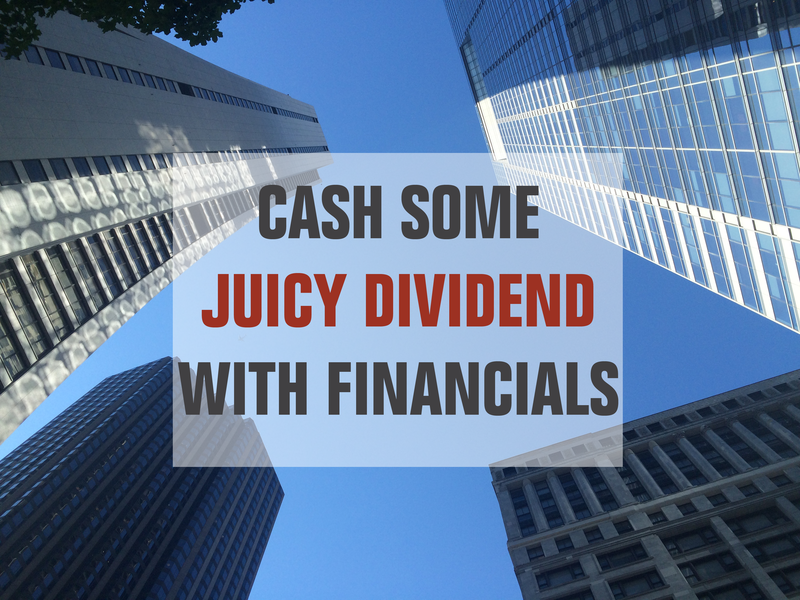 The financial sector is both exciting and scary for dividend investors. On one side, you have solid banks, the heart of our capitalist system. They are a sign of trust, stability and growth. On the other, you think about all the exotic financial strategies like mortgage backed securities, options and swaps. You realize that even those who manufactured those products don’t always understand the complexity of the monster they created. Nevertheless, financials represent a true investing opportunity for dividend investors. There are lots of strong banks, financial firms and insurance companies sharing the wealth with their shareholders. Just remember not to fall for a strategy you don’t fully understand. This article explores this sector, defines how it can boost yield in your portfolio, and provides you with a complete dividend stock list including comprehensive metrics. Asset managers: companies that are managing / investing money for others. Mutual funds, hedge funds, real asset managers, and ETF managers are part of this group. Asset managers usually perform consistent with the overall market. It is very rare to see an asset manager’s stock price increase during a bear market. Banks: you can sub-divide this group into global and regional banks. You can also look at investment banking, commercial banking or the credit side as individual industries. In the end, it all comes down to deposits and loans. This group benefits from higher interest rates as the spread between loan rates and deposit rates will often play to their advantage. Insurance: this last financial segment includes life, property & casualty, reinsurance, speciality and brokers. Insurance companies require strong asset management skills to align their revenues with potential claims costs. It is also easier for them to manage their assets during higher interest rate periods. What Financials Stocks Can Do For Dividend Investors? Many investors will insist on having a few banks in their portfolio. Now that we have recovered from 2008 for good, many banks have cleaned up their balance sheets and show strong financial profiles. Regulations are now stricter, and do not allow the financial acrobatics that we have previously seen. Due to this tighter regulation, you can expect financials to pay sound dividends that will continue increasing for years to come. The Financials Dividend Stocks list is being updated on a quarterly basis. While most sectors will see interest rates rising as a bad sign for their business, it is quite the opposite for most financials. Banks will likely enjoy a wider spread between deposits and loans in a rising rate environment. This gives additional flexibility to price mortgages at higher prices, and earn better interest on their investments. Insurance companies will benefit from bonds offering more generous yields to satisfy asset regulations to match their claims. Asset managers will be able to offer more attractive fixed income products. Asset managers and financial advisory firms are also known to be more inclined to paying special dividends. Companies like CME Group (CME) and Lazard (LAZ) pay a quarterly dividend, and they also usually pay a special distribution based on their performance. It’s a great perk when you are in a bull market. When analyzing asset managers, the focus is often aimed toward total assets under management (AUM) movement. Don’t get fooled by AUM growth supported by a bull market. Look for net inflow or outflow of cash. This is the real cash a firm receives (or gives back) from their clients. Unfortunately, those companies are also highly sensitives to what’s happening in the market. Banks finance businesses and consumers. Therefore, when the economy slows down, and bankruptcies rise, banks can often take losses quickly. BlackRock is not only the world’s largest asset manager by assets under management (AUM), but it is also a dominant leader in one of the fastest growing investment products: Exchange Traded Funds (ETF’s). As low-cost fees and passive investing solutions tend to grow stronger, more money is being transferred toward BLK. BlackRock offers investment products in all asset classes enabling it to generate fees regardless of whether investors are bullish or bearish. Royal Bank is the largest bank of the group by market cap (it battles with TD) and provides various financial services to individuals as well as commercial and institutional clients. RY has a strong position in the personal and commercial banking sector (50% of its revenue). In 2015, RY bought City National, a Los Angeles-based bank focused on high net worth clients. The transaction opened doors into the US market and added another growth vector: wealth management. TD is the second largest Canadian bank by market cap, and is often playing side-by-side for the 1st position with Royal Bank (RY). TD is the most classic bank in Canada as its business model focuses a lot on retail banking. Its loan portfolio is well diversified between Canada (61%) and the U.S. (30%). JPMorgan Chase is one of the U.S. financial behemoths with over $2.6 trillion in assets under management. It employs over 240,000 people and is present in 60 countries. It offers financial services in a wide range of fields such as investment banking, financial services for consumers and small businesses, commercial banking, financial transaction processing, and asset management. The bank is well diversified across all these segments of business, but interest income remains about 50% of its total revenue. 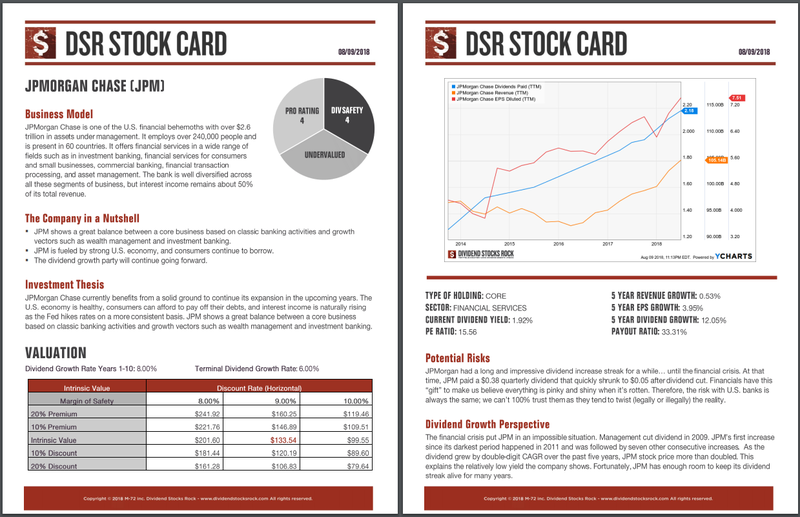 If you liked the Financial dividend stocks list, but you are looking for additional sectors, you can register to our free newsletter and receive an exclusive access to all our sector dividend stock lists. For each industry, we cover both U.S. and Canadian dividend stocks.